Yeah, that's right. Last night they announced it and parked their last aerplane. My flatmate had no less than 6 flights planned with Spanair, and now he lost his money and has to buy all those tickets again. Very frustrating. In the long run, I guess it's bad for air traffic in Spain also. Spanair has been in the market more than 25 years. Now, there's Vueling & Iberia (already merged a couple years ago, then killing ClickAir and a lot of competition as three airlines became one) And there's Air Europa which is honestly always (?? At least every time I have checked) so much more expensive than the other options. And that's it for Spanish airlines. Ryainair is more and more present though, especially here in Barcelona after they last year started flying to the main airport of Barcelona and not just Reus (Tarragona) and Girona (Girona). 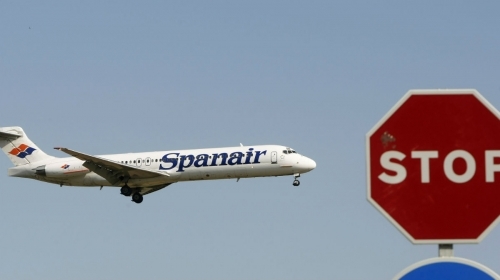 Some newspaper says the competition from Ryanair is actually one of the reasons for the closing of Spanair. Oh wow, how terrible is that! Your poor flatmate! I really feel for your flatmate. I'm sure there are a lot of very frustrated people out there. I'm glad you didn't have anything booked with them though. Thanks girls, must be very very frustrating for everyone who lost their tickets! And the employees who worked the whole month of january and 1)won't get paid, 2)lose their job..